[QUIET KIDS HAIR CLIPPERS] Baby clippers for hair with quiet design to lower vibration; equipped with brass axis to reduce noise; keeps your baby at ease during hair cutting. 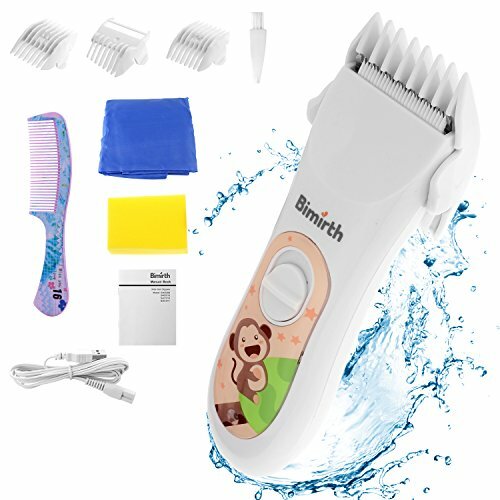 [SAFE AND EASY TO USE] IPX-7 waterproof hair clipper with easy assemble blade, 3 replaceble guide combs, easy to use and clean, safe for your lovely baby. [QUALITY MATERIAL] Ceramic / stainless blade, unique R shape bevel design, no scratch on baby\'s skin. [USB RECHARGEABLE] Driven by built-in NI-MH battery, which can be rechargeable by adaptor, power bank or PC. 5 hours of a single charge last 60 minutes! [WIDE USAGE] Not only for baby, but also for kids below 12 years old. You can even use it for cute pet grooming DIY shaving at home. A free gift comb in random color is offered!